I love our house. I love my garden, which has fed us quite nicely this season. And now, I have another (3 fold) reason to love our house: fruit trees. Apple, peach, and pear to be precise! Yesterday morning, Peter dutifully used his height to my advantage and got some fruit. 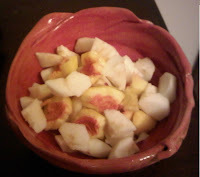 I peeled and diced it and had a nice bowl full! After trying to figure out a recipe that would happily showcase all our delicious fruit (and we knew it was delicious, since we'd eaten an apple, peach, and pear between the four of us when he was picking), I decided on a mixed fruit pie. 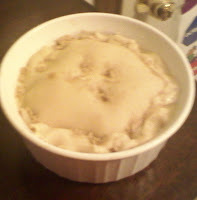 (A mini pie, since we didnt pick that much). 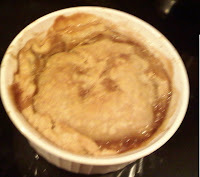 So, I boiled the fruit and used my apple pie recipe, using the fruit mixture instead. I popped that bad boy in the oven and the smell nearly killed me and sent me to pie heaven! It smelled great. Peter's lucky I love him so much, because I actually debated serving this for lunch for the kids and I when I pulled it out of the oven! But, alas, I'm a good wife :) (usually). 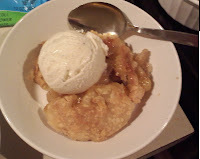 I waited until after our Indian food was on the table and then heated the pie in the oven so that the vanilla ice cream would melt lightly as we were noshing it down. Delicious. It was the best pie ever, according to the mister, who coerced me (with quite a bit of off color humor) to give up my pie. :) It worked. I was laughing too hard (both at his comedy as well as the straight face with which he delivered it) to eat and he finished his pie, my pie, and part of the kids' bowls! I'd say it was a fruity success!!! That looks delicious! All we have is a lemon tree and a tangerine tree. I really need to find things other than just lemonaid to make! It looks yummy! And it is so special because the fruit has come from your own garden!